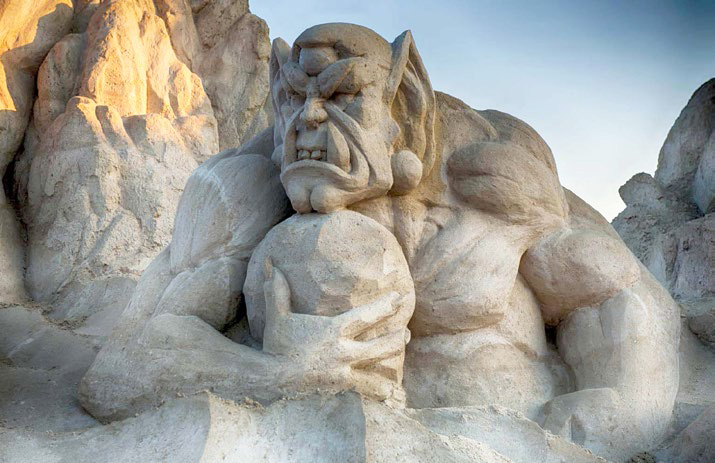 An annual event for the past 15 years, the Søndervig (Denmark) Sand Sculpture Festival features some of the most amazing sand sculptures in the world. Above: As part of a Vikings theme in 2014, this wall of sand was a sight to behold. At the 2014 Remal International Festival, in Kuwait, a sand sculpture inspired by the book One Thousand and One Nights. 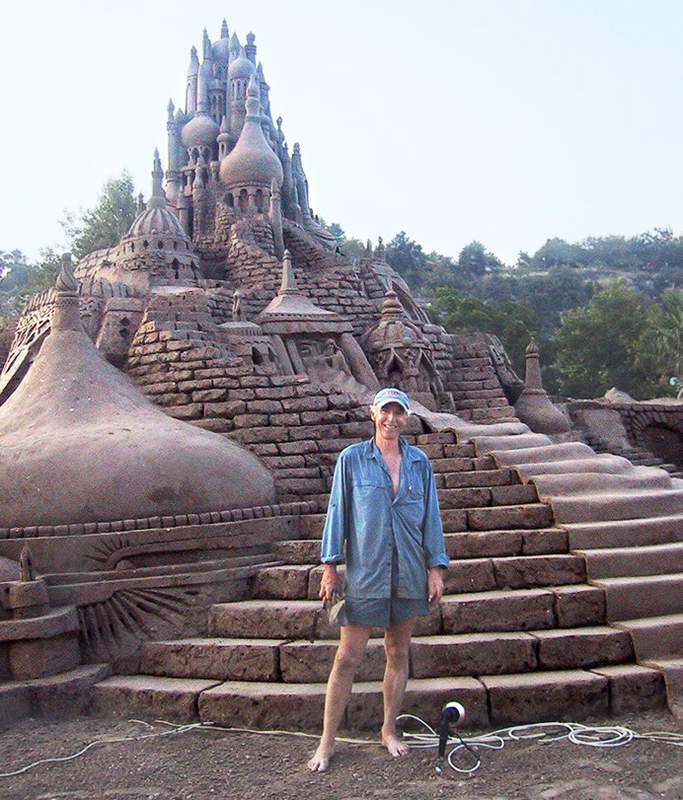 Santa Cruz-based Kirk Rademaker stands with his newly completed castle in Antalya, Turkey in 2007. "It's the excitement," she says. "I love working in the sand." It's a widely shared sentiment. "I enjoy the feeling of sand. I enjoy working barefoot," Belcher says. "When the moment is there, and you're carving away, and your hand is doing its thing, and your eye is guiding your hand, and you see these shapes evolve before you, it's like sketching in three dimensions," Jara says. "Sand is fun," says Belcher, the landscape architect, "because you can push its structural limits, but you have to know what its limits are and what you can do with them." "And people watch you," he adds. "That can be good, but it's also stressful. You can hear 100 positive things, but it's the one negative thing that sticks in your brain." "Part of the art is social art," Jara says. "The relationships I have with people while making the sculpture is art itself." Rademaker says, "The medium is intoxicating. It's seductive. To me, it's life. It's a way I can express myself on so many different levels." Sand carving appeals to "people who don't really like the 9 to 5 job," says Rademaker, who, like many sand carvers, refer to other carvers as family. Many meet at competitions and as partners on far-flung jobs. In the last year, Rademaker says, sand has taken him to Canada, Taiwan, Mexico, Acapulco, Slovakia, Switzerland, Russia, and Hawaii. 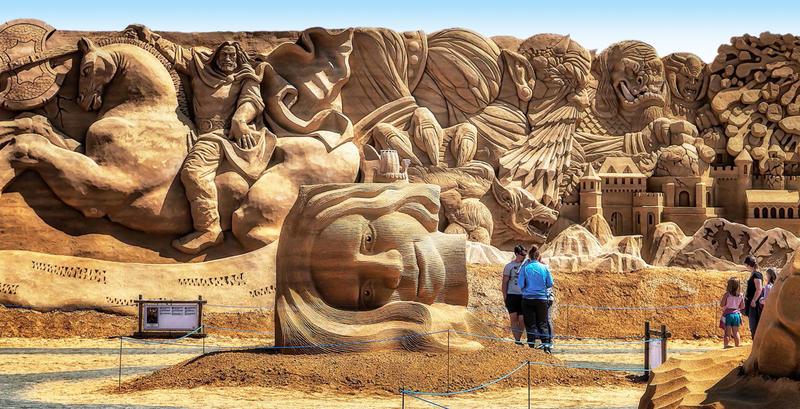 Asked whether sand sculpting is lucrative, Rademaker says, "We do okay, we do alright. But we are not getting rich. But the lifestyle is totally seductive." One memorable job was creating a sand sculpture at a party thrown by Dustin Hoffman. "We've all worked for famous people," Rademaker says. "That's part of the fun of the job."